Commercial, Industrial and Residential Electrical Service. Installation, Maintenance or Repair. Get quality service and friendly advice from a professional today. Franklin Bell are Perth's Premier Data Cablers and Electricians - with more than a decade experience in the electrical and communications industries. We understand the unique challenges you can sometimes face when dealing with contractors, and we're ready to make it easy to get the results you need. Not sure where to start? No need to worry - we'll listen to your requirements and deliver the best solution, while giving you great advice and solid results from start to end. We do all commercial and residential electrical work, data cabling and telephone systems. Plus! 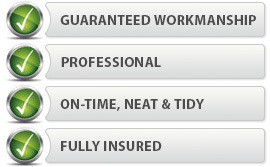 Every bit of work we do is fully guaranteed for your peace of mind. Our personnel are knowledgeable, helpful, and friendly. What's more, we take pride in being well presented, clean and efficient - just what you need in your work environment. As specialist data communications contractors with vast experience ranging from carrier grade broadband to advanced technology integration, we're the service provider of choice for Australia's premium brands, delivering innovative solutions to the complex communications demands of modern business. We can help design, build, repair or maintain broadband and wireless networks, and deliver stable, scalable cabling projects on time. To get your commercial project done quickly and professionally - contact us today for a free quote. We'll make it easy for you to do what you enjoy most while we take care of your project. Our customers keep reminding us that we're different - perhaps that's true. All we want to be, however, is dependable. And easy to work with.